It's now 2009, and I thought I'd celebrate here in my own style. Above is a Wordle generated from all the most commonly used words from the Rubenerd Blog for 2008. 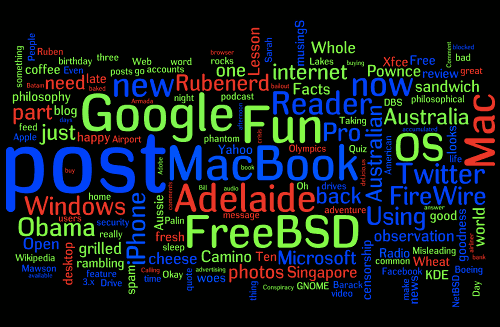 It seems 2008 was a year for Google, the MacBook, Adelaide, FreeBSD, OSs and Mac. Lesser used but also important words were Obama, Internet, Australia, Twitter and FireWire. It's hard to believe that it's already 2009, it feels as though 2009 only just begun itself. Wait, did I just say 2009 just begun? That's funny, because it did in fact only arrive yesterday. Wait, that isn't funny, it's true. Then again don't they always say that fact is stranger than fiction? This raises a series of interesting questions. If fact is stranger than fiction, does that mean truth is therefore stranger than fiction? Does this mean what's true is more interesting than what has been fabricated? I think I may be onto something here! Happy new year everybody, here's hoping 2009 is better than 2008. Given the bar was set so low, I doubt this will be a problem.